I've never quite understood the fixation by some Muslims with the 9/11 conspiracy. After over 15 years, there still has never been a shred of proof regarding this theory but rather an enormous amount of conjecture. It appears to be the modus operandi of the conspiracist to raise red-herrings regarding the attacks (i.e., financial motivations, discrepancies in eye-witness testimony, etc.) but never actually gives conclusive evidence and to this day I've never seen actual convincing evidence of a large scale conspiracy. In general this conspiracy (it's major forms) even contradicts itself. The proponents suggest that we didn't hear explosions, because the building was rigged with non-explosive thermite (no proof that this is true either). However they will then begin quoting eye-witnesses who claim they heard large explosions. Also the inanity of the theory comes to light when looking at the big picture: two R/C planes flew into the WTC, but instead of using a third for the pentagon, they used a cruise missile (broad daylight), and not only that this cruise missile also was somehow able to leave pieces of an American Airlines fuselage on the lawn of the Pentagon. Oh and there was no plane in PA, but rather, a hole was dug and filled with garbage (wouldn't it have been easier to fly another plane into the ground). When looking at the theory on a macroscale, it becomes obvious that anywhere that there could be doubt, a claim was made. No clear footage of plane, claim it wasn't a plane. Witness says they heard explosions, claim explosives used. People didn't hear demolition like explosions, claim no explosives used. All in all, I think it's not befitting of this website to support such a theory. Not only for the obvious flaws within it, but anyone who is from the Middle East is well acquainted with figures such as Osama Bin Laden, and Al Qaeda, they had been around long before 9/11 and were ardent enemies of America--with no proof of any collusion. Even after the massive leaks via wikileaks, no documents ever supported these conspiracies. Re: Why does this site subscribe to this conspiracy? 1- The twin towers were brought down through controlled demolition (through implanted dynamites). 2- Tower 7 that was not hit at all was also brought down by controlled demolition. 3- The pentagon was bombed by a drone and not a jumbo jet. 4- The Pennsylvania field was empty. Only empty trenches and no wreckage of any airplane. We have reports on live TV confirming all of this and more with video and picture. Are you one of those today's salafi turds who had been ordered to advertise against the lie of 9/11 by Saudi Arabia after their almighty god, Donald Trump SWT, ordered them to do so? So if someone thinks the conspiracy there is asinine, they must be trolling? Also threatening to ban someone because they disagree with you point of view on a subject is an affront to actual discourse which this site purports to promote. Try to control your emotions and have a reasonable discussion before making threats please. It's your website and you may do as you please, but that type of behavior is not appreciated. 1 - There is not "undeniable evidence" that the twin towers were brought down through controlled demolition. Dynamite is an explosive, if explosives were used, especially in the manner of a controlled demolition, you would very clearly hear successive explosions (time's perfectly)--this was not heard. Not to mention the amount of cables needed to rig a building, none were seen by firefighters, or photographers. 3 - This one again, is the most ridiculous. If it was bombed by a drone, where did wreckage of the fuselage come from? (View here http://911review.com/errors/pentagon/imgs/debrisHR.jpg) and not only that, what caused the light poles to be downed on the highway across from the pentagon. It was officially stated to be from the airplane wing clipping it--how could a cruise missle or drone, ALSO down a light pole? 4 - Do you know what would happen to a plane which nose dives at 500 mph into the ground? Do you think much of it would survive at all? The "truthers" always refer to photos of planes that CRASH LANDED, not of planes which nose dived. Also there were bodies found there. You also failed to address any of the logical points I've stated. Why were r/c planes used in some places, but not used on the Pentagon/PA? Why does the theory contradict itself so many times, you say dynamite was used... but no audible successive explosions (REQUIRED FOR CONTROLLED DEMO IN THAT FASHION) what's next you'll tell me silent thermite was used? Can't have it both ways. I hope you change your mind, Inshallah. There are clear evidences regards to 9/11, i have done extensive research. Infact even before 9/11, there was a secret government document that got leaked not to long ago known as "New American Century" in this document the neo-cons in the government planned to take down 7 muddleeastern countries in 5 years and place their proxy government in place. Infact saddam hussein was put in by them however he broke protocol and he had to be killed. Getting back on topic, that document corralates with Od Yinon's Greater Isreal Project where Isreal wants control of all the neihboring arab countries. So far isreal has shown by its actions that is exactly what is going on. 9/11 in this context was a planned incident that had many reasons. 1. Larry silverstein a zionist american jew who leased the twin towers was being sued for millions of dollars for restoration fees because the building was infested with asbestos. 4. Larry silverstein said "pull it" to the fire department giving them authroity to go ahead and demolish the building 7. 5. Bush admin already knew and were paet of the plan, infact younger brother of george w. Bush, marvin bush is among the directors of the security company for the twin towers, SecuraCom. 6. There were3 isreali mossad agents caught by police because they were overlooking the event and were jumponh with joy. 7. Till this day isreali zionists say 9/11 was great for them. 8. When twin tpwers went down there was a huge cloud of asbestos. U will see there is substaintial evidence to prove this. Infact larry silverstein recieved 4.6 billion dollars in insurance payment for a policy he bought a week from 9/11. Till this day this plan is being carried out. 4 - Do you know what would happen to a plane which nose dives at 500 mph into the ground? Do you think much of it would survive at all? Yeah doofus, much of it would survive, and even bodies would be recovered as this happens all the time. But in the PA field, no airplane wreckage was ever seen. We have videos of reporters saying this real time as they were there. Also, we have videos of eye witness saying he saw what appeared as a SMALL 20-PASSENGER JET hit the pentagon. He saw it descending. No jumbo jet. It was a painted drone, and the picture that you gave above further confirm this. It was a piece of a small drone, not a jumbo jet. And I didn't threaten to ban you if you replied. I threatened to ban you if you didn't. Salafies are just too stupid. Maybe it's my luck with the rubbish that I run into from them often. So now you're all popping out of the sewage because your god Donald Trump commanded your masters to defend the 9/11 lie? "In response to what has become known as "Arab Spring", FPI has emphasized to U.S. policymakers that long-standing authoritarian rule in the Middle East and North Africa have created stagnant political and economic systems that are corrupt, oppress political dissidents, create unemployment and fuel anti-American sentiment. FPI's policy solution is the long-term success of democratic and economic reform, specifically the promotion of human rights and democracy." While they like to use such beautiful words like democracy and saving people from oppreasive governments. The truth of the fact is they created these oppressive governments. They bring about regime change and instill proxy governments that oppress citizens even further. Truth of thr fact is, Middle East, NEVER ASKED THEM FOR HELP. Thus isn't an act of goodwill or helping neihbor human beings. It is an all out invasion and regime change for political interests. Asalam ul laykum, i came across this article very disturbing by the Global Research Agency. It is most troubling because it has clear evidences of US, Britiain and Isreal role in Middle East, not only this. 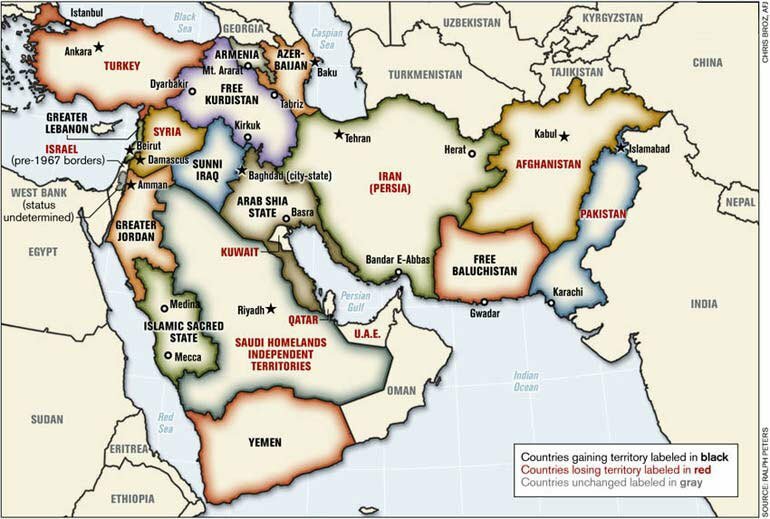 But it has the Map of the "New Middle East" they are creating by spreading chaos in the region. As we can see slowly but surely they r getting what they want a proxy Middle East that is under there control. The entire agenda of US and Britain is the same agenda as Isreal. That is OD Yinon Greater Isreal Project. "The overhaul, dismantlement, and reassembly of the nation-states of the Middle East have been packaged as a solution to the hostilities in the Middle East, but this is categorically misleading, false, and fictitious. The advocates of a “New Middle East” and redrawn boundaries in the region avoid and fail to candidly depict the roots of the problems and conflicts in the contemporary Middle East. What the media does not acknowledge is the fact that almost all major conflicts afflicting the Middle East are the consequence of overlapping Anglo-American-Israeli agendas." So there is ABSOLUTLY no dought that all that Middle East has been suffering is thanks to Good Ol Americam Government, Britain and Satanic Isreal. Brother Osama i recommend saving these links and also i will look into making a DOC with information correlated by these government articles. Jazaka Allah Khayr for the good arguments and for the map. Indeed a picture is worth a thousand words, and the map you provided says it all. I have saved it to the website and re-linked it, akhi. I also gave its URL as you can see for further research.